Healthcare professionals often don’t realize how words, tone and actions impact others. At times, colleagues may intervene, and outside resources are often recommended. This course is designed to fulfill credentialing or licensing board requirements for remedial education. It is also suitable for healthcare professionals who simply wish to improve their skills in this critical area. 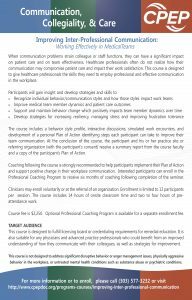 This course is designed to give clinicians the skills they need to employ professional and effective communication in the workplace. Participants gain insight into their own style and behavior through interactive small-group discussions and analysis of simulated workplace encounters. Optional coaching following the course is strongly recommended. This helps participants implement their Plan of Action and support positive change. For an additional fee, interested participants can enroll in the Professional Coaching Program to receive six months of coaching following completion of the seminar. 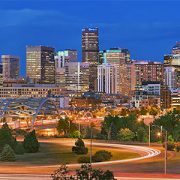 This seminar will be offered three times through the end of 2019 in Denver, CO. Please Click Here for a list of available sessions. A list of the upcoming courses is available at the bottom of this page. How do I enroll in Improving Inter-Professional Communication? Enrolling in Improving Inter-Professional Communication is easy. Simply Click Here to access the registration page. What do others say about Improving Inter-Professional Communication? Who is eligible for Improving Inter-Professional Communication? This course is suitable for any physicians and advanced practice professionals who could benefit from an improved understanding of how they communicate with their colleagues, as well as strategies for improvement. The cost for the course is $2,500. Optional Professional Coaching Program is available for a separate enrollment fee – please inquire. This course was developed in collaboration with the Colorado Nurses Association. CPEP would like to thank COPIC Medical Foundation for their generous support of our efforts to bring this important course to Denver.